Marek Blaško won the 888Live Festival Rozvadov Opening Event, taking home a first prize of €27,824 after outlasting a field of 783, the largest for an 888Live event to-date. Midway through today’s play, he said aloud to his tablemates: “I like to play!” and judging by his performance today, not only does he like to play – he’s good at it too. 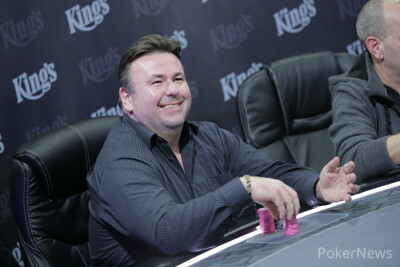 Over the course of the day’s play, Blaško used his chip stack to great effect, eliminating six players inside the top 20 on his way to a final table where he outlasted and out manoeuvred the other eight players. His confidence in big hands (most notably against Massimo Fuina and Igor Grytsak) was most noticeable, but his shrewdness in the tight three-handed play was even better. At times he appeared to play each of his opponents off one another in his pursuit to dominate proceedings. By the end of play, it seemed almost an eternity ago that 150 players sat down to start the day, and we were treated to some big pots early on. With day 1b chip leader Ruben Perez tangling with Juan Carlos Vecino. Perez would go on to hold around 5% of the chips in play, with 74 players remaining, but he would fade to finish in 19th place. The money bubble itself lasted exactly one hand. The unfortunate bubble boy was Sergey Topchiy whose King-Ten failed to catch up to day 1a chip leader Bartosz Szafraniec’s Ace-Jack. In fact, in addition to Szafraniec (12th – €537) and Perez (19th – €1,175), all four day 1 chip leaders made the money, the other two being Simon Hoffmann (66th – €537) and Nadi Yusuf (30th – €769). By the time it got to the final table, there was a veritable selection of characters. From the quiet Andraz Zaplotnik, who earlier had tripled up with queens against two players holding ace-king, to the unorthodox approach of Russian Alexander Dmitrienko. And who could forget the boisterous ‘El Magico’ figure of Huseyn Erbay, who took great joy in announcing that it was ‘King’s Casino Luck’ which brought him such a deep run. All of them played a part in proceedings, but it was Blaško who was headlining, helped along by the likes of Massimo Fuina and Igor Grytsak. Two big hands helped cement Blaško's position as head honcho at the final table. 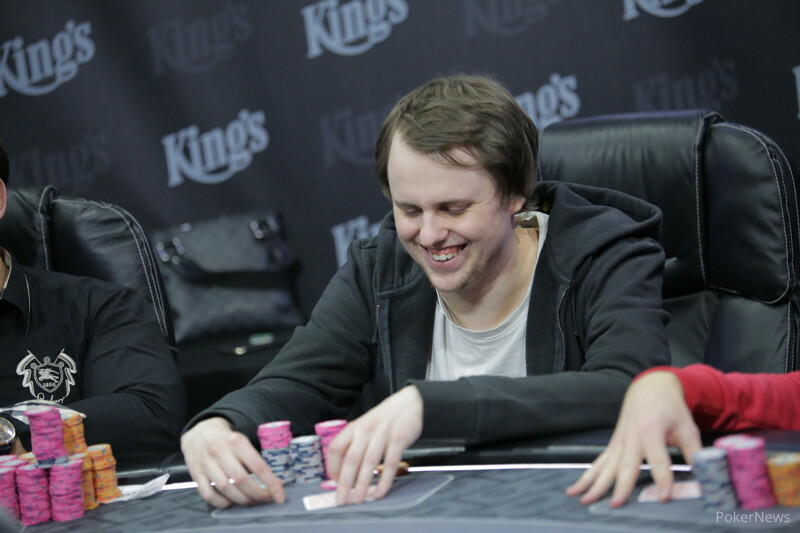 First, with the pair first and second in chips, Blaško found a call with ace-king on a king-high board against the pocket jacks of Fuina. Then, after Fuina had been eliminated in 6th place, Blaško pulled a similar move in getting maximum value from a turned full house against Igor Grytsak. Grytsak will feel hard done by to have not gone further than fourth after his jacks were cracked by ace-jack. Similarly, Thorsten Fleischhut was second in the chip counts for a long time, before finally getting caught out twice by eventual runner-up Uwe Fritzenschaft. When Blaško finally reached heads-up against the stocky German Uwe Fritzenschaft, the two players considered a deal which would give Blaško $25,216 and Fritzenschaft €20,000. “Let’s play,” came the reply from Fritzenschaft, “I don’t care about the money - definitely not €2,500"
The two continued to battle it out, with Fritzenschaft gaining ground on his opponent who at one point remarked “I’m playing really bad,” as the day’s play perhaps caught up with him. Fritzenschaft grew in confidence, but never looked like making up quite enough ground on his Slovakian counterpart. In the final hand. Fritzenschaft found sixes but failed to crack Blaško’s kings and Blaško headed to the cage to collect his money. "So Marek, €25/€50 tomorrow? €50/100?" asked one of his friends, and Blaško let out a grin. Who knows whether Blaško will play cash with this money, all we do know is that he certainly loves to play. Uwe Fritzenschaft raised to 625,000 and Marek Blaško three-bet to 1,500,000. The German then four-bet all in and Blaško's chips very nearly beat Fritzenschaft's into the pot. The board ran out and Fritzenschaft reached over and firmly shook his opponent's hand to congratulate him. However, Fritzenschaft didn't want to play for just €2,500 more and declined the deal. Uwe Fritzenschaft moved all in from the small blind and Thorsten Fleischhut called from the big blind. Fleischhut was behind and at risk, and was already standing to shake his opponent's hand as the flop came . The turn was the and the river was the . The remaining two players have taken a small break before looking at the numbers for a potential deal. Uwe Fritzenschaft moved all in for his remaining 1,950,000. 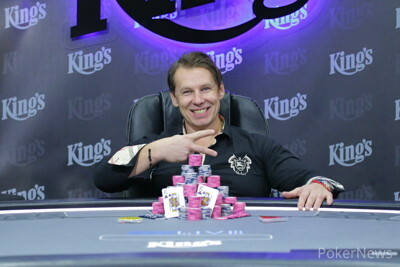 Thorsten Fleischhut then moved all in for his remaining 4,000,000. Marek Blaško folded in the big blind. "I'm ahead?" said Fritzenschaft turning over , before his opponent turned over . "Ah, I'm alive." The board ran out and Fritzenschaft said "Thank you," as the dealer counted out his double up. 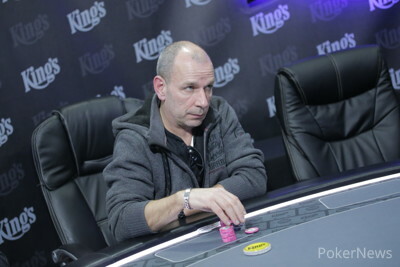 Uwe Fritzenschaft has been steadily losing chips and has now dropped down under the ten big blind barrier. He lost three pots in a row, including one against chip leader Marek Blaško. Fritzenschaft raised to 475,000 from the button and was three-bet by Blaško from the big blind to 1,200,000. Fritzenschaft called. The flop was , but Fritzenschaft folded when Blaško bet 600,000.